Jamie Eden sent in this picture taken in Iroquois County, IL, 26 July. I was " On the Road for Obama!" The article contends that the campaign has started months earlier than usual, America is undergoing profound change which will make this election different, and the election could be on par with the most important elections in history. The print article features a picture of the Obamalac, Hillary, Romney, and Giuliani. The online article features only the Obamalac. For the online article, take a look here. Labels: "The Wild Card Election"
From the AP. Fairfield, Iowa, 3 July. He's seen the car before but this is the first time he's seen it with the decals on. 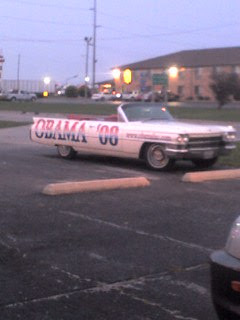 This car hauled Obama for Senate signs to Rock Island, Moline, and East Moline homes back when he was in the state senate working for the people. What a smile! He's come a long way and he's going even further! Bettendorf Iowa 4th of July parade. From the Iowans for Barack web site. 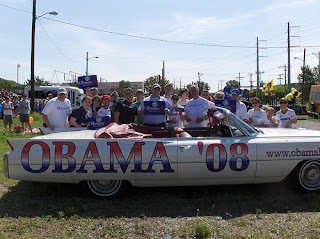 The day started with a morning parade, and to fit in with the old fashioned theme, we sported a ’63 Cadillac convertible with “OBAMA 08” decals on both sides (nicknamed the ‘Obamalac’). If that weren’t enough of a spectacle, the huge number of volunteers walking alongside the car wearing Obama t-shirts, while passing out Jolly Ranchers and Obama for America stickers certainly caused us to stand out. In all, it was a great old fashioned Fourth. We got to spread the word about Barack to so many people, hand out tons of stickers and signs, and some of us even learned how to paint faces. And, of course, we had the privilege of walking in a parade next to the Obamalac. As a young man I remember hearing about the slogan "We'll Be Free By '63!" Back in the 1950's that was a slogan of future promise to people of color. The slogan asked for their patience for a better time to come. When I had the graphics people make the signs for the Obamalac, I added the "The Time Is Now" as a display line. To me it means Obama is our candidate today, not our black candidate for the future. And he doesn't need to wait for "his turn" like Bob Dole, both Bushes, McCain, Al Gore, Hillary and so many others. This picture was taken by the Washington Post. There was an AP story about one of the TM guys at Fairfield telling me how the time is always now. As you can imagine we had a very short discussion. I was surprised while watching Tucker on MSNBC last week when his guest, Cliff May, said the comment was his favorite part of the Fairfield story. I'll post the MSNBC transcript when they release it. BOTTOM LINE: It's my car, It's my line, and He's my candidate, today! THE TIME IS NOW! MAY: Tucker, I don‘t think Americans like empathy. Let me say that. 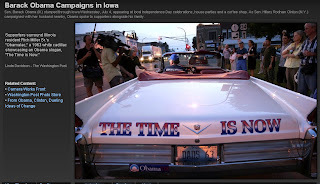 But my favorite part of the story is the Obama supporter who had written on his car the time is now. And a Maharishi follower said but the time is always now. WOLFFE: Very creative reporting. I hand it to the Politic there. But I was there in that crowd. You could not tell that was a Maharishi crowd. Fairfield does exist as a real place beyond people doing Yoga and transcendental meditation. People everywhere are hungry for Obamara and his message of hope. Readers from coast to coast, Canada and Mexico, and elsewhere are sharing info on this blog. Kuopia Finland, Las Palmas De Gran Canaria Spain, So Roque Portugal, and Ketsch Germany are just a few places outside the USA that access the Obamalac Blog! We were fortunate enough to reside in Ketsch for a few years and learn from wise, experienced leaders such as Herr Otto Boxberger! Illinois State Senator Kwame Raoul (13 th District) sent me this hat. We met in Springfield, IL for Obama's presidential primary announcement 10 February. Kwame is a guy that is so easy to talk to, to listen to, and to like. He replaced Obama in the IL State Senate. 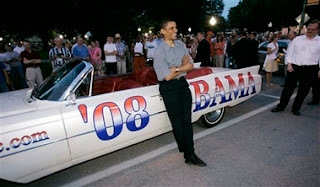 I offered to drive the Obamalac to Chicago in support of his election efforts next year. Obama signed the hat for me 3 July while we were in Fairfield Iowa. The Washington Post recently published a group of pictures of Senator Obama's latest campaign through Iowa--there is even a picture of the Obamalac. Look for it at number 14 in this series. Thanks to Tripp Wellde for the tip. Heather Miller (no relation) sent me this video she took of Senator Obama and the Obamalac. Enjoy. Thanks Heather for sharing the video. Behind him, a man driving a red, white and blue 1963 Cadillac convertible with the word “Obamalac” and “The Time Is Now” carefully stenciled across it was being gently chided by a wiry, smiling meditator. “The time is now,” the driver said, as he headed out of town. “But the time is always now,” the local man said. At one point the owner of this car pulled up in front of Obama’s ride, and the secret service told him to move on.